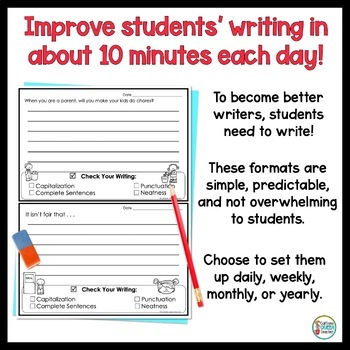 Get your students writing every single day with these 208 prompts laid out in a journal format that is simple and logical for students, and simple to prepare for teachers! 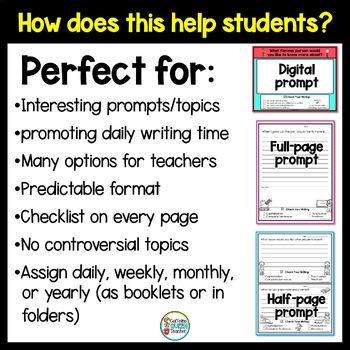 The prompt types included are expository, persuasive, narrative, and creative styles. I LOVE these Quick Writes prompts because they're fun, thought provoking and the length is just right! This Bundle of Quick Writes includes 208 different and unique prompts! I did my best to avoid controversial subjects and no specific holidays are mentioned. Each page is divided into two journal prompts with enough space to write a short paragraph. The length is not overwhelming for young writers, and students will quickly become accustomed to the style of these prompt pages. You'll LOVE how the prompts lend themselves to interesting class discussions! 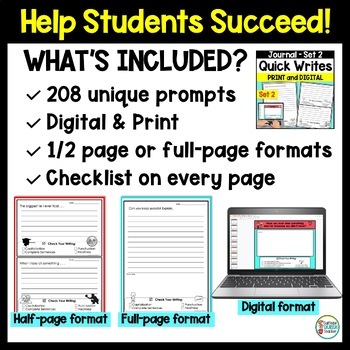 Each prompt includes a self-assessment for the student in the form of a checklist for capitalization, punctuation, complete sentence, and neatness. 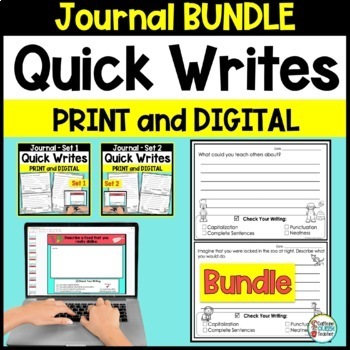 This money-saving BUNDLE is a combination of Journal Writing Prompts Pack 1 and Pack 2 - please do not buy this bundle and the 2 separate packs because they are the same! *At the end of the school year, this journal could be bound in an attractive folder or binder and given as a Mother’s Day or Father’s Day gift! I received feedback from a third grade teacher stating that she loved getting to know her students through these questions. A parent of one of her students loved the prompts and writing because it became a keepsake forming a snapshot of her child at the age of nine. This Journal Writing Prompt Bundle provides you with 208 writing prompts – which is PLENTY for a full school year! 300 Writing Prompts - Year Long Set!